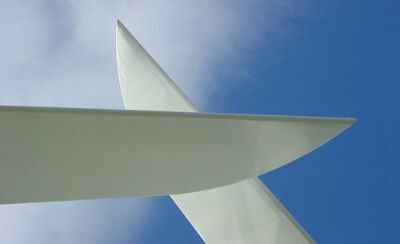 This year we did not go to the full 3-day event at Goodwood. I managed to get down to the first day on Friday, which is where these pictures are from. 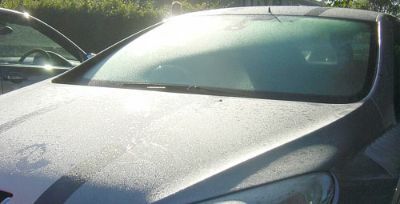 Peugeot Silhouette Concept car with early morning dew. 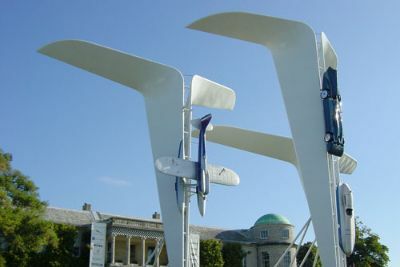 Every year there is a featured manufacturer, who normally have a central display in front of the house. Tradition is that they also have a massive display - it must be getting harder to improve on the previous years efforts! 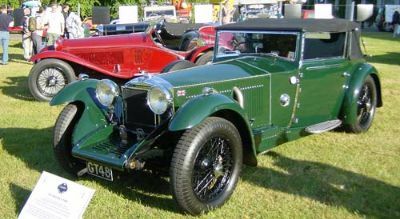 This year the featured manufacturer was Rolls Royce. 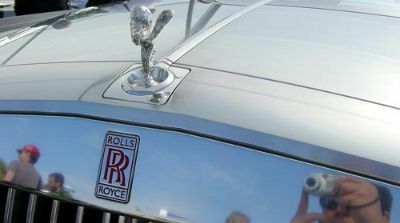 Their amazing display featured 3 world famous vehicles, each of which were powered by Rolls Royce engines. 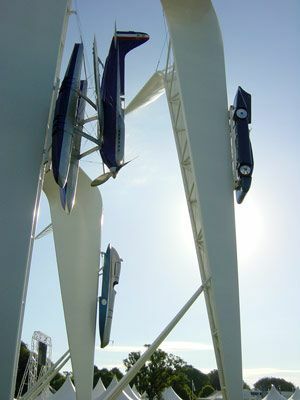 4-wheels were represented by a Bluebird World Land Speed record breaking car, the air was represented by a Supermarine seaplane, and the water by a replica Rolls Royce powered water speed record machine. 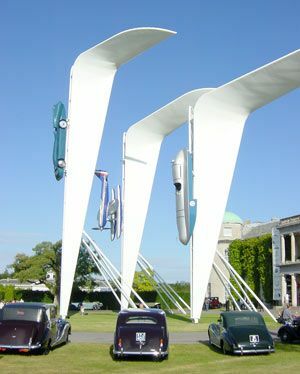 Underneath this amazing display there was an array of Rolls Royce cars, from the very early Silver Ghost to the most recent BMW Rolls Royce concept car. I was very lucky with the weather for the day that I was there - I think Saturday at least was a little wetter! 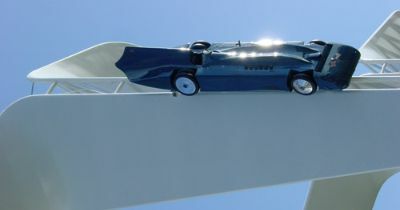 Sir Malcom Campbell's Bluebird land speed record breaking car from 1935. Its 2300hp, 36.5 litre supercharged V12 Rolls Royce engine reached 301.129mph on the Bonneville Salt Flats, Utah. Amazing Supermarine seaplane. Built to win the Schneider Trophy this very plane competed in 1929 with an average speed of 325.54mph. 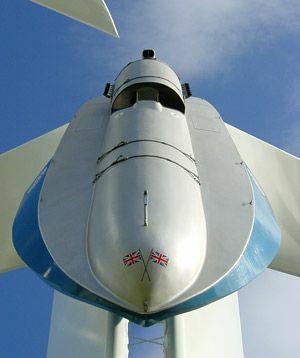 The boat was the only replica on the display, the car and the plane were original and real! 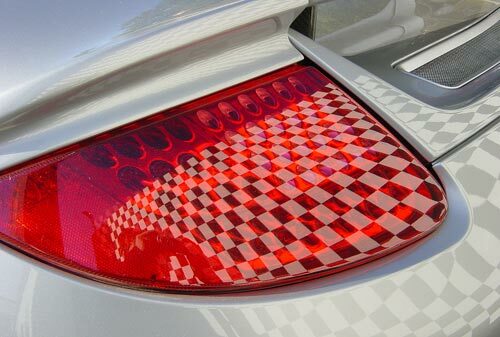 This was Campbell's K-series (!) - K4 which reached 141mph on Coniston Water with Sir Malcom Campbell at the helm in 1939. 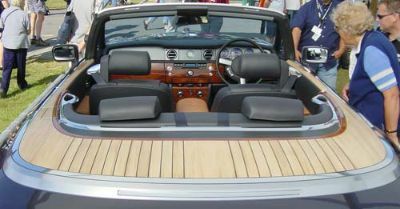 Later in 1949 his son Donald reached 152mph with the Rolls Royce powered boat. 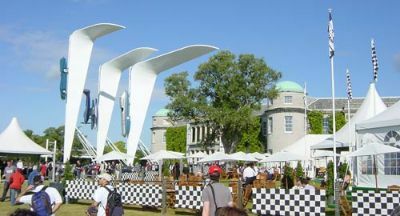 Crossing the famous track just in front of Goodwood House. 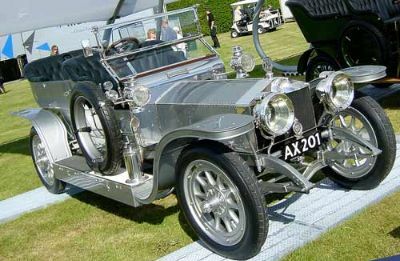 Rolls Royce Silver Ghost - one of the most famous cars. 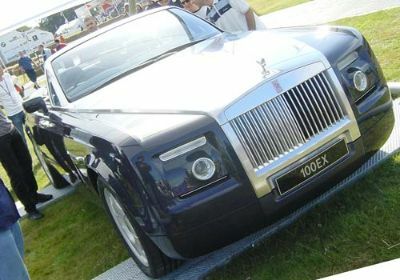 The Rolls Royce concept car - the 100EX - an amazing open top version of BMW's huge Rolls Royce saloon. 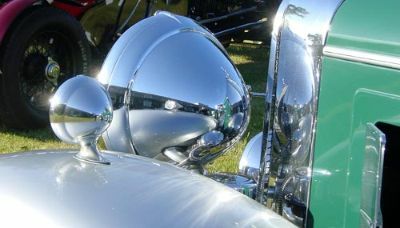 The windscreen surround and bonnet were machined out of a single billet of aluminum! Some lovely wood detail. This one off car was probably worth more than most of the cars at the show, and I think later it was roped off from sticky fingers. 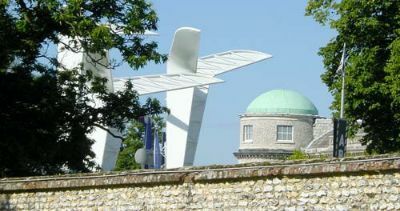 Part of the concourse show located beside Goodwood House. 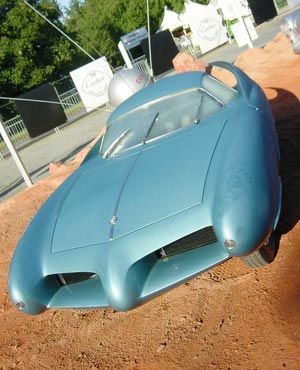 Bertone-designed 1954 Alfa Romeo BAT 7, part of a collection of 'Space Age' vehicles. 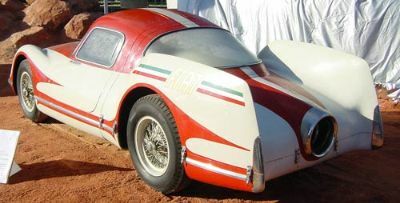 1954 Fiat Turbina prototype gas-turbined powered car. 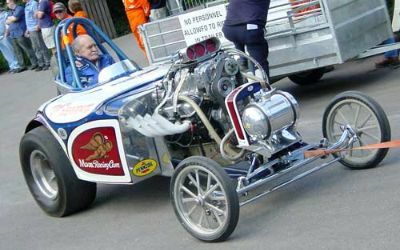 Something for everyone at Goodwood - in this case a collection of 'Wacky Racers'! 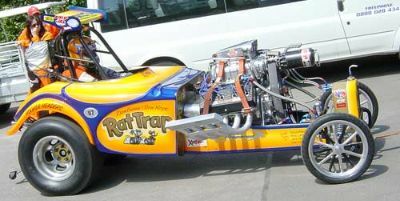 Amazing motorbike/sidecar combination race machine, without the body. 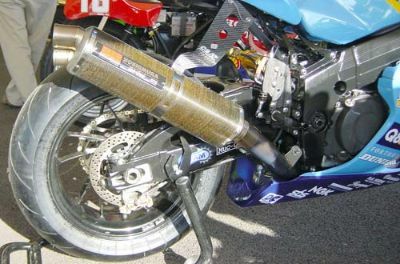 I guess the driver lies over the exhausts, and just look at those slicks! 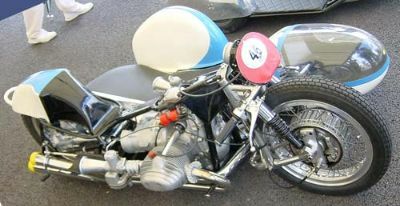 Compare the tires on this slightly older motorbike/sidecar race machine, a 1957 BMW RS500. 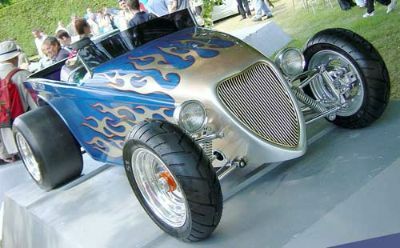 These 2 Hot Rods are actually scale models, about a metre long. Elsewhere in the show there were plenty of full sized versions. 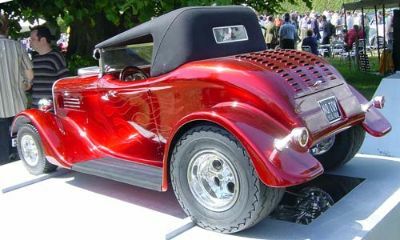 As at previous recent Festival of Speed events, Hot Rods and dragsters were represented and demonstrating up the hill. 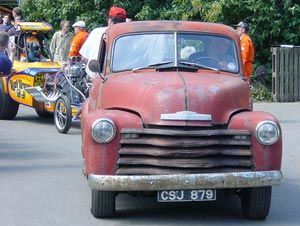 This is the period tow pick-up, pulling 'Rat Trap' out onto the track and down to the start line. Another mean looking tow car.